Limit load movement and prevent costly cargo damage with these protective bars. Rubber end pads hold bars securely in place. May be positioned vertically or horizontally. Choose one-piece or two-piece construction. Two-piece enables unit to fit easily inside locked trailer cab when not in use. IN STOCK. Mounts vertically or horizontally. 1-1/2", 14-ga. square tube. Non-slip mechanical ratchet. CARGO BAR WITH ALUMINUM STOPS. For use in trailers. Locking handle. Rack and pinion jack. CARGO BAR WITH STEEL STOP AND HOOP. All-welded construction. 19-1/2"H hoop. 70-3/4"L top loop; 78-1/2"L bottom loop. CARGO BAR WITH E- AND A-FITTINGS. 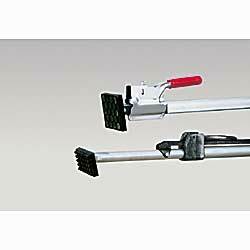 2-1/2" x 3-1/2" aluminum tube has a 2-3/8" x 3" steel tube that slides and locks in each end. Adjusts 92102". E- and A-track fittings on both ends. YD-1100 Wt. 19 lbs. 1-pc. Galvanized Cargo Bar. 87119"L.
YD-1101 Wt. 19 lbs. Folding Cargo Bar. 87119"L.
YD-1104 Wt. 12 lbs. 1-pc. Cargo Bar. 89104"L.
YD-1102 Wt. 35 lbs. 1-pc. Cargo Bar. 87116"L.